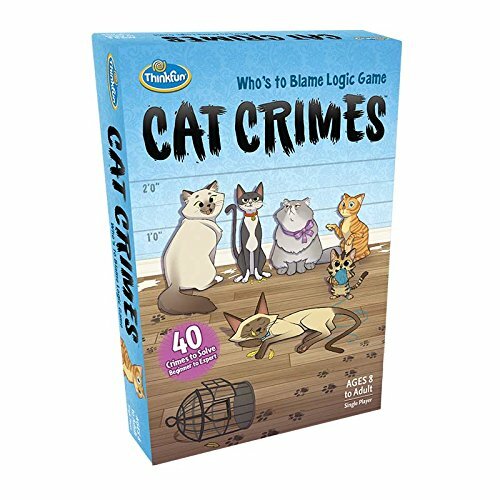 Cat Crimes is a game published by ThinkFun. It is for 1 player, but may be played cooperatively with more players. In this game, a player will be trying to solve a series of mysteries, perpetrated by some very sneaky and mischievous cats. The player will need to use their deductive reasoning and logic skills if they hope to uncover the felonious feline. In the end, if the player is able to determine the culprit, they will be declared the winner. To begin, the board is placed in the middle of the play area. The player will then choose a Challenge card, based on difficulty. Each particular Challenge card describes the crime that was committed. The player will then take the specific Crime Token that matches the image on the front of the Challenge card and place it over the corresponding position on the board. For instance, the broken flower pot token would go on top of the flower pot image on the board. The Cat standees are then placed within reach of the player to be placed around the board during the game. Once the player is ready, play now begins. As the game is played, the player will read over each individual clue to determine the placement of each particular cat. Each clue will reference one of the cats. The clue also may give an identifying trait, a position relative to one or more of the other cats and/or to one of the pieces of supporting evidence on the table. The clue may also may also reference the Birdcage or Fish Bowl. In some cases, the clue may mention that the cat or cats were upstairs sleeping. In this case, these cats will not be used in the particular challenge. Positioning the cats means understanding some of the terms used in the clues. For instance, if the clue says a cat is sitting in front of something, then it is placed at the location closest to that item. Other terms used are near, next to, between, to the left, across from or 2 seats from another cat. Understanding each of these clues will help the player to determine the placement of each cat so as to satisfy all the clues on the challenge card. Once the player has placed all of the cats around the board and they can name the cat sitting in front of the crime token, the game is over. The player has caught the culprit and they win. To make sure, the player checks the back of the card which shows the placement of each cat and which cat is the guilty one. The player is then able to start all over with a new challenge and a new crime. The game comes with some amazing looking components. First off there’s a fairly large deck of challenge cards. As a matter of fact, there are 40 different challenges in 4 different difficulty levels ranging from beginner to expert. The cards are a bit larger than your normal deck of playing cards. They have a nice glossy finish and are a good thickness. Each difficulty level is color coded. So for instance, beginner challenges are green while expert cards are red. Each one is easy to pick out. Each card has a series of clues on the front along with a picture of the crime token used in each challenge. On the back, the guilty cat is revealed along with the placement of each of the cats around the board. These are great. Each one is a little harder and a bit more challenging than the previous one. Each one is individually numbered so that you can progress through each challenge if you like. The board is amazing. It is very thick cardboard with a linen finish. The table that the cats sit around is actually a separate layer of cardboard that is in the middle of the board for a dual layered effect. The individual cats are huge cardboard standees that are quite thick, just like the board and have a linen finish. Each one has a cute picture of the cat that it represents along with it’s name. 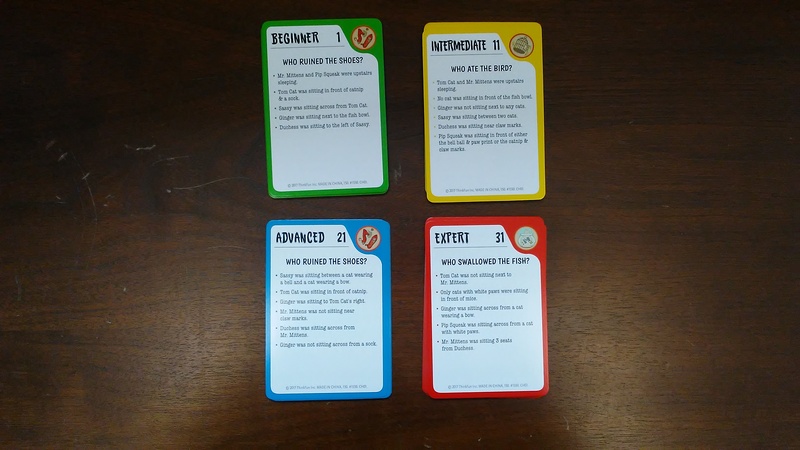 The crime tokens are also thick cardboard with a linen finish. These depict everything from a spilled cup of coffee to a broken flower pot. These are used to cover up the original art on the board. For instance, the cup of coffee is covered with the spilled cup of coffee. The artwork on all of the cardboard pieces is absolutely adorable and is so much fun to look at. I really like the designs and love how big and nice looking each piece is. My daughter loves all the different cats and enjoys telling stories with them, even when she’s not playing the game. The game itself is very good quality. The pieces are large enough that even children and adults with smaller hands should have no problems manipulating them. The one minor problem that I have with the game is that when you get ready to put the game up, you have to remove the cat standees from their bases each time, as the box isn’t large enough to hold them assembled inside. Of course, this is only a minor gripe as everything is so thick that it hasn’t been a problem as of yet. So far there has been no damage to anything, even though I’ve removed them from their stands several times already. Overall, I’m completely in love with how cool everything looks. This is a great looking game. The rulebook is very good. There are plenty of pictures and examples throughout the book. There is a very nice 2 page spread that explains the board and how to understand each picture on it. The rules are thoroughly explained from placing crime tokens to the key terms used in the game and how to position the cats. The book also includes some tips on playing the game as well as detailed bios with pictures on each of the cats. The book is cute and fun and is very easy to read through and understand. Everything is extremely simple and is easy enough that kids can understand it. My daughter had no problems with the rules at all. Overall, I feel that the rulebook does a great job of explaining the rules and helping players get started solving crimes. I really like how the book looks and is designed. Apart from being extremely cute and well designed, the game itself is actually quite fun. While intended for a single player, this is one that a parent or sibling can help out with quite easily. 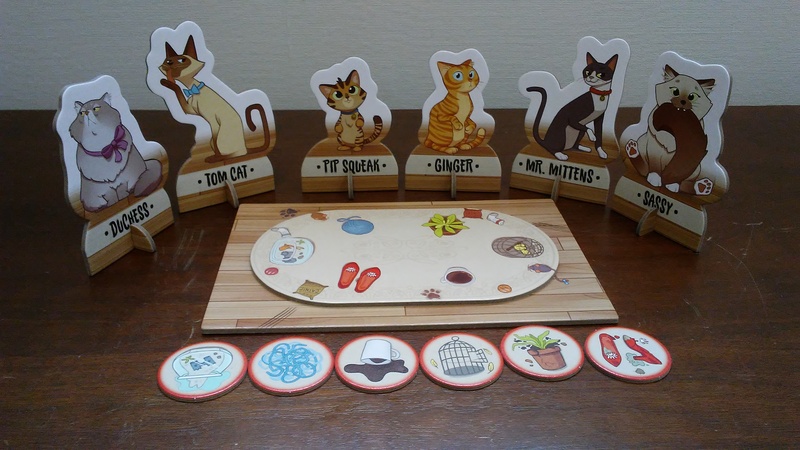 The object of the game is to place the various cats around the table in such a way that each of the various clues on the challenge card are met. The card will give you clues such as what a particular cat is sitting in front of or which cat they’re sitting across from. Of course these are only a few of the many different varieties of clues to be discovered while playing the game. The idea is that you want to determine which cat is sitting in front of the crime token. When you’ve completed all of the clues, you’ll wind up with the guilty cat at the scene of the crime. I’ll be honest, starting out the clues are pretty darn easy. As you get into some of the harder challenge cards, especially the expert ones, even I had a bit of trouble figuring them out. It’s not wonder that on a couple of occasions, I had to step in to help my daughter figure out a particular clue or help out with a specific challenge card. This game is really great at helping children with some logical thinking and a bit of deductive reasoning. I think it’s also great for helping parents and children work together. For me, I like games like this that make you think, even though it’s designed more for kids. My daughter and I both really enjoyed this one. Even though we still have some challenges left to explore, you can bet that we’ll be solving those crimes very soon. Fans of puzzle games or game that make you think, should enjoy the challenges presented in this one, especially if they like cats or have children. This game is a lot of fun and one that I know we will revisit. I would definitely recommend this one to parents as a way of helping to encourage logical thinking. It’s a great game that is super cute and loads of fun. Cat Crimes is a logic based game of deduction that involves some mischievous kitties. The game doesn’t take very long. Each challenge card takes anywhere from a couple of minutes to 10 minutes or so, depending on the difficulty. Players can play as few or as many challenges as they would like. The artwork and design of the components is really great. I love how thick the cat standees, crime tokens and game board are. I especially like the dual layered board and the cute and fun artwork. The one complaint that I had is that you have to remove the stands from the cats every time you put up the game. I really wish the box had been a bit bigger to accommodate fully assembled standees. The rulebook is easy to read through and looks great too. I especially enjoy the various bios and pictures of each of the different cats. The game itself is a puzzle filled gold mine. It’s a lot of fun trying to figure out where each of the cats are sitting and which one committed the crime. My daughter and I both enjoyed figuring out each crime and working together to solve them. My daughter really enjoys the huge standees and loves telling stories with them by themselves. Parents with kids of all ages should enjoy the challenges that this game presents and how it helps their kids with their deductive reasoning and logical thinking. Overall this is a very fun game that we all enjoy. I only hope that there will be some more challenge cards available in the near future to add to the fun that we’re already having. In any event, this is a game that I would definitely recommend for parents to pick up for their kids. If you miss out on this one, it’ll be a CAT-astrophe. This entry was posted in Reviews and tagged board, board games, card, card games, cat, cat crimes, crimes, fun, games, think, thinkfun. Bookmark the permalink.